What are armor skills, what do they do and how can you use them most effectively? Monster Hunter World, eh? Yeah, that’s a pretty good game, as we’re all discovering. 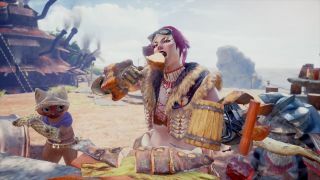 Get some pals – or randoms – together, head out into the wilderness and slaughter some unassuming, innocent herbivore in the name of ‘research’, before carving it into pieces and either cooking it or making it into clothes/weapons. Bliss. It’s not a simple game, though, and there’s plenty to learn as you go along. But rather than having to figure out the still-rather-obtuse systems within the game, it’s much easier to just come to us for explainers on things like, say, armor skills. Like this one here. This explainer on armor skills. Right here. Ahem. Armor has stats – how much protection a piece offers, how much resistance it has to different elements – but it also has extra skills listed on its info pane. These armor skills – activated automatically on equipping a piece of armor – are something you might not pay attention to much at first, but as you get into the swing of things you’ll realise they’re very important to the Monster Hunter World experience. Each skill offers a boost to a different thing – it could be making you stronger, it could be making you faster or maintain stamina longer, it could be something completely different. Armor skills also come in a different levels, from one up to seven, though not all skills have seven levels (more on that below). Whatever the skill is, it’s something you have to both pay attention to and take into consideration when kitting yourself out. It’s also a system much simplified compared to previous Monster Hunter titles, thankfully. What do the armour skills mean? Rather than list the armor skills and what they achieve – as well as their level cap – right here, they’re going to be shunted down to the bottom of the article – don’t want them getting in the way of any other info you might be looking for. But if you are after a list of what each armour skill is and what it does, scroll down. Some, like Defense Boost, are self-explanatory. Others like Bombadier you will probably figure out quickly enough. But then there’s some that are just confusing or vague, like Wide Range, so it’s nice to have the list of armour skills and what they do to hand. How do they affect my game? This can go one of a few ways, really. You can ignore armor skills, but that would be daft. You can pay attention to them but not actually take them into consideration when equipping your hunter, which is also daft. Less daft-ly, you should end up either building your armor sets around specific armour skills and boosts – opting out of grand defensive upgrades in favour of a higher-level effect, for example – or you should build the best armor for your specific loadout/play style while also factoring in armour skills. Neither way is wrong, really. Or daft. How do I level up armour skills? You cannot level up armour skills in Monster Hunter World just by visiting the workshop and spending an armor sphere – that will upgrade its base defensive stats, but you’ll need a different approach to improve the levels of your armour skills. Basically: you need to stack. What this means is you’ll want to gather – and wear – multiple pieces of armour with the same skill on them. Each separate piece of armour being worn with the same skill will add together to increase its efficiency – an early-ish example being combining Anja Coil and Bone Mail, which will bump your Attack Boost skill to level two. Decorations also feature armour skills so can be factored in with high rank armour kits, and later on in the game you will unlock armour with more than one armour skill per piece, so there’s more scope to mix and match as you progress. Finally, charms – these little trinkets include armour skills to add to your bonuses, but differ in that they can be upgraded by improving them at the smithy. Another thing to bear in mind if you’re looking to max out a skill. Are there any other skills? Yes! Unique skills come with full high rank armour sets of certain types – unsurprisingly available after defeating Monster Hunter World’s most difficult quarries. This is high level stuff you won’t be touching for a long while, but keep an eye out when you do face the likes of the Vaal Hazak, Pink Rathian and – of course – Nergigante. Hopefully that all puts you on the way to conquering any wee beastie that stands in your way. After all, a good, thick helmet is often more useful than a hunting horn, because the hunting horn is… too hard to use. Hmm. And now the list of armour skills!